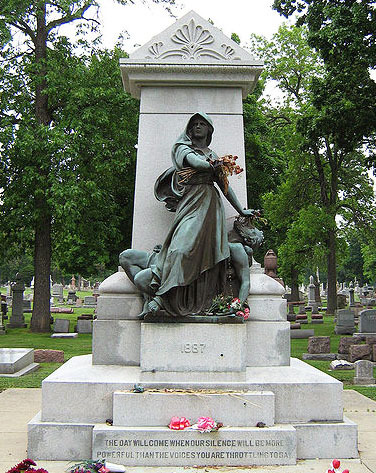 Built in 1893, the Haymarket Martyrs’ Monument reflects a radical tradition that has largely gone unrecognized as public historians have sought out the fields roots in the past. Photo: Wikimedia Commons. This working group will frame a series of interlocking research projects that can challenge our understanding of “shared authority” and “civic engagement.” Each of us has an investment in the idea that public historians should put themselves in a position of service. Indeed, people have always used history as a way to give shape to a plan for addressing injustice. At the same time, the power dynamics in play in the field of public history can undermine true solidarity and derail the potential of historical inquiry to promote social justice and enable social change. We believe that better understanding the history and practice of politically engaged public history is a necessary step to further the evolution of our field. Among my latest research and work in the field of public history is a historic signage project I am working on in the Germantown section of the city of Philadelphia, in which my partner and I are attempting to address issues covering a very large arc of history encompassing the settlement of the area by Mennonites and Quakers in the late 17th and early 18th centuries, to the cultural transition in the neighborhood influenced by the influx of Eastern European immigrants and African-Americans during the late nineteenth and early twentieth century. Because of this, we are exploring a variety of eras, topics, and themes, from early religious and economic history, Revolutionary War history (the blocks we are looking at encompass the area where the Battle of Germantown took place), Abolitionism, and also modern issues surrounding race, class, gender and sexuality. We have interviewed dozens of business owners and local residents and have actively sought out community involvement in discussions,. Overall we are embracing the idea that public expressions of history can be recast through the lens of exploring its changes and celebrating its diversity. Additionally, since I am on the board of the Germantown Mennonite Historic Trust, we are using the space of our historic site (a 1770 meetinghouse) to hold community charettes as well as other dialogues surrounding disseminating the neighborhood’s history. These discussion have been exciting and helpful, and hopefully we can quantify our results. I like Lara’s ideas about drafting a code or statement of ethics that guide or inform the field, as well as a possible document(s) relating to best practices of the field, helping to inform those of us who believe in supporting or working on community- based, progressive and diversity oriented public-history projects. Furthermore, a more structured framework for how to proceed with such endeavors then, such as strategies exploring the best ways to engage and involve community members in such undertakings, or how to work with local, private, governmental, non-profit, community development corporations, or other organizations may be some components to address in a best practices document. Hey– we could also perhaps start up a new journal devoted to our niche! I really look forward to meeting everyone, and thank you Denise and Dan for facilitating this blog.